Rochester Chess Club Blog: Weekend Chess Tournament Results: Local, Geneseo, World! 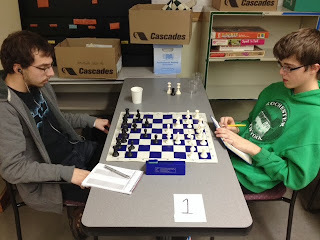 Weekend Chess Tournament Results: Local, Geneseo, World! The 2nd SUNY Geneseo tournament was a great success. 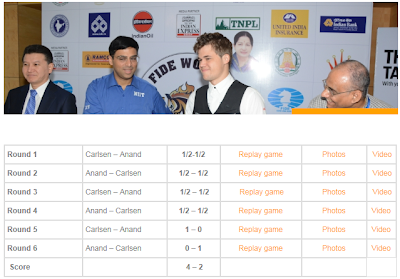 There were 3 sections: Open, U1400 and un-rated with a total of 71 players. Details/photos/games will be coming shortly. Results below are incomplete at this time, but will be added shortly. Thanks to James Hiltunen and Nicholas Sortisio for organizing a terrific tournament! Note: Prizes below are in the form of Amazon.com gift cards. Peter Carter (right) won the 4th round game and the U1400 Section title against Nathan Saint Ours at the SUNY Geneseo Fall Chess Tournament on Saturday, November 16th, 2013.